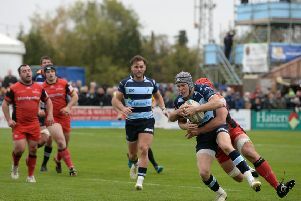 Mike Rayer has told his Bedford Blues players to end the season on a high on Saturday as they welcome Nottingham to Goldington Road on Saturday. The Blues, who lie in 10th position, have had an up and down season on the pitch but the Bedford head coach is hoping they finish with a win as they look to move forward into next year’s campaign. “The group has been together through lots of ups and downs this season and we want to finish at home well,” stated Rayer. “There have been more downs really but they’ve stuck together through the course of the season and they deserve a lot of credit for that. “There is no better way to go and express themselves and finish on a high note on Saturday, they have worked hard every week and their attitude has never been questioned. In the return fixture between the clubs on the opening day of the season, Nottingham won 19-10 at Meadow Lane thanks to 14 points from the boot of Will Maisey. Looking back over the whole season, former Wales international Rayer feels his side’s performances have warranted better results, including those against the top-five teams in the league. He said: “It’s been hugely frustrating we haven’t got results because some of the performances could have delivered that. “Everyone else will accept the top five have been the most consistent sides in the division and they deserve to be there, the rest well we could all be anywhere from sixth to 10th.